The Smoky Mountains Never Disappoint! Head south to enjoy colors that delight, meals that will stick to your ribs, and entertainment that will keep your toes tapping! Get ready for the kaleidoscope of autumn colors to dance as you begin your journey through Illinois and Indiana to Louisville, KY, where you will spend the night at the legendary Galt House. CUMBERLAND FALLS STATE PARK: Lunch and tour in this breathtaking spot before the coach heads toward Tennessee. COUNTRY TONITE SHOW: You'll get time to freshen up in Gatlinburg, TN, before you delight in your group dinner at the Applewood Farmhouse Restaurant & Grill, followed by the show voted "Best in the Smokies" year after year. 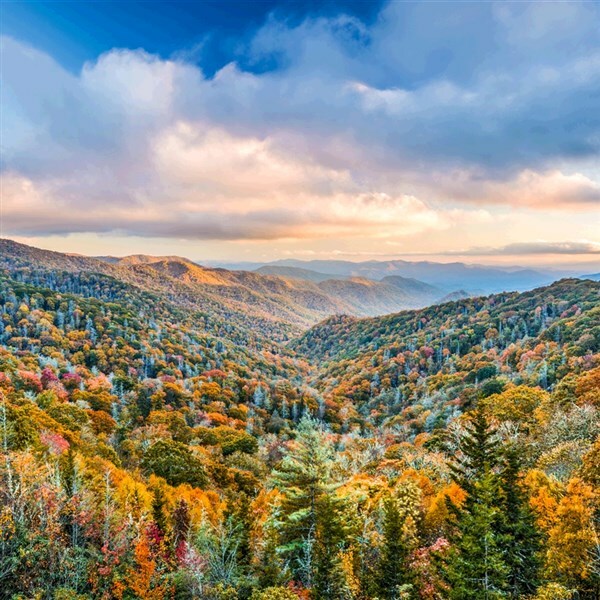 GREAT SMOKY MOUNTAIN STEP-ON GUIDE: Take a leisurely ride through the hills and hollows of east Tennessee. See where Dolly Parton used to play her music. Experience the natural beauty of a river flowing under a covered bridge. And infuse yourself with the charm of the Smoky Mountains. GATLINBURG: Spend the afternoon getting to know the Gatlinburg area either by the tram or trolley, both included. 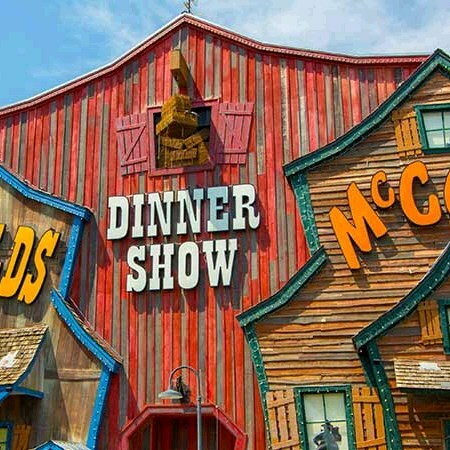 HATFIELD & MCCOY'S DINNER SHOW: After such an active afternoon, kick back while taking in the feudin', feastin' family fun at this down-home performance! CHIMNEY ROCK STATE PARK: Ride the elevator 26 stories up to the top of Chimney Rock for a stunning 75-mile view of Hickory Gorge, bursting with fall foliage! 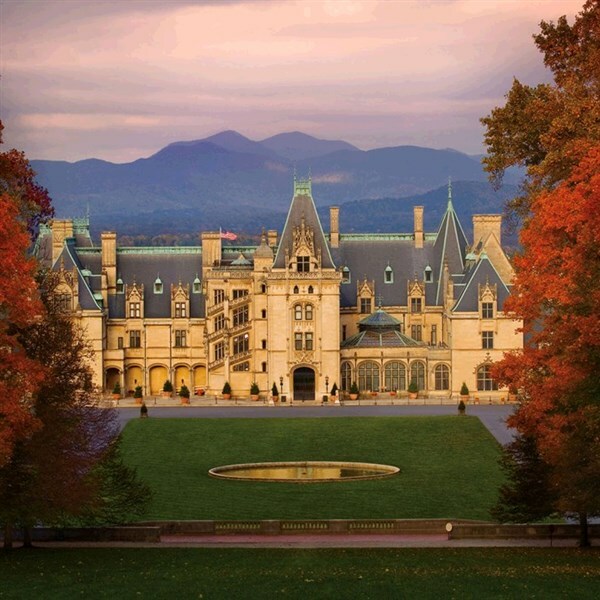 BILTMORE ESTATE: Experience George Vanderbilt's 8,000-acre estate, nestled in the mountains of Asheville. It's the largest privately owned home in America! Pay attention to the extraordinary architecture. Marvel at the extensive art collection. Tour the estate winery. Delight in the grand gardens. Best of all, lunch is included. Bid adieu to the spectacle of the Smokies today, but find plenty of grandeur in historic, artsy Berea, KY, a favorite Van Galder stop. Let your eyes capture the last blazes of fall on your homeward journey, savoring their colorful splendor. DEPOSIT: $50 at time of reservation; final payment due September 2, 2019. ACCOMMODATIONS: Galt House, Loisville, KY (1 night), Hilton Garden Inn, Gatlinburg, TN (2 nights), Hampton Inn Asheville-Biltmore, Asheville, NC (2 nights), Boone Tavern Hotel, Berea, KY (1 night). TOUR INCLUSIONS: Professional tour director, motorcoach transportation, accommodations, luggage handling at hotels, admissions/attractions, and 13 meals, including 6 breakfasts, 3 lunch, and 4 dinners.